About the Software	The Complete Multimedia Collection for Home and WorkMedia Suite 16 is the complete collection of multimedia software for the whole family – not just at home, but at work or school as well. 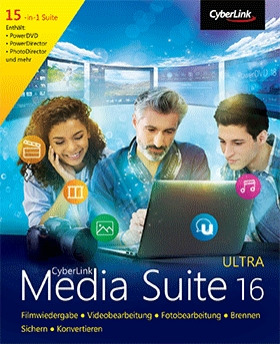 For years Media Suite has led the way featuring CyberLink’s multi-award winning Create & Play software solutions. Now Media Suite 16 enters the office with the inclusion of powerful work … tools that make business communications a breeze. The combination of media playback, burning, editing, and work solutions allows Media Suite to satisfy the needs of the entire family. Key features PLAYPowerDVD Never miss a moment of your favorite shows with the Always on Top Mini View. NEW Enjoy YouTube Live in enhanced quality and watch online with multiple subtitles. NEW Wireless media casting via Roku®, Apple TV®, Chromecast™ and now also Fire TV™. NEW Experience entertainment in the best possible quality with TrueTheater® enhancements. Complete media center functionality with full support for a wide range of video, photo and music formats. CREATEPowerDirector & PhotoDirector Edit and adjust 360 videos with enhanced design and stabilization features. NEW Create videos with optimized sound quality using professional-grade audio ducking. NEW Create professional-quality videos in 3-steps with Express Projects. Add TrueTheater® color enhancements for vibrant, realistic productions. UNIQUE Transform short clips into moving pictures with the new animated GIF maker. NEW Make your images picture-perfect with ease via the smart content-aware removal tool.WORK NEW PRODUCTS U Meeting, U Meeting & U Webinar Newly designed platform for video conferencing and team collaboration. Experience online video conferencing with exceptional audio and visual quality. Communicate in real-time via an intuitive interface and scheduling system. Deliver engaging online presentations and interact or host Q&As with an audience. Broadcast live, pre-record and schedule webinars ahead of time. Trim and index videos on demand to keep every broadcast lively and engagingRIP, BURN & CONVERT Power2Go – Duplicate discs, rip entire music albums or mount ISO files without additional software. Video files are automatically resized to the highest quality via the Smart Fit feature. MediaEspresso – Make file transfers fast and easy with functions that clean up undesirable pixels and improve the lighting in your photos during the transfer process. system requirements Windows - MinimumOS: Microsoft Windows 10/8/8.1/7Processor: Intel Core™ i-series or AMD Phenom® II and aboveRAM: 2 GB or aboveHard Disk Space: 6 GB for product installationGraphics Support: 128 MB VGA VRAM or higherScreen Resolution: 1024 X 768 pixels, 16-bit color or above	Burning Device: A DVD burner (CD-R/RW, DVD+R/RW or DVD-R/RW) is required to burn VCD/DVD/SVCD/AVCHD titles. A Blu-ray Disc recordable drive is required to burn Bluray Disc titles	Video Capturing Device: PCI or USB1.0/2.0/3.0 capture device compliant with WDM standard (i.e. PC Camera and TV tuner with WDM driver. Web camera (built-in or external USB)	Microphone: A microphone is required for recording voice-overs	Internet Access: Required for program activation and other online services.